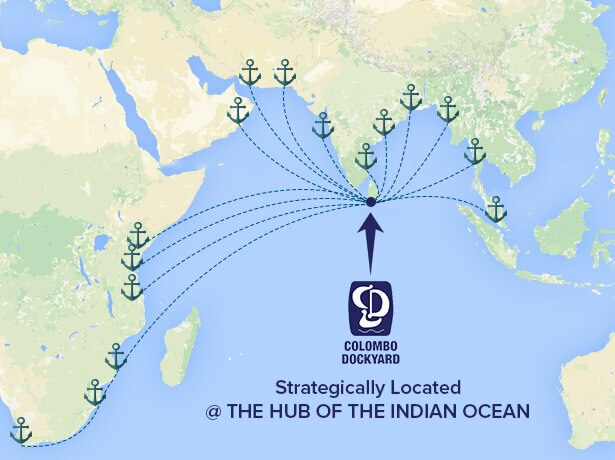 Conveniently located within the port of Colombo, Sri Lanka. Colombo Dockyard has the ability to conduct both dry dock and afloat repairs. They operate four graving dry docks with a maximum capacity of 125,000 DWT and extensive repair berth facilities. Routine dry docking repairs, major layup repairs, collision damages, conversions and retrofits are professionally expedited. We also have extensive experience in machinery, piping, steel, electricals and electronics. Colombo Dockyard is capable of handling all routine, damage, and retrofit repairs. The four drydocks range from 9000 to 125,000 DWT. The largest drydock caters to tankers, bulk carriers, and offshore drill rigs. The 30,000 DWT drydock accommodates the feeders and trampers plying regional waters. The two 9000 DWT drydocks provide ideal docking facilities for offshore support vessels, naval vessels, trawlers and work boats.